In September 2013, Tesoro Corp spilled 840,000 gallons of fracked oil onto North Dakota farmland. Three years later, they are nowhere close to repairing the damage. In September 2013, a North Dakota wheat field became the “ground zero” of one of the largest onshore oil spills in recent US history. A pipeline, managed by Tesoro Logistics, spilled an estimated 840,000 gallons of Bakken Shale fracked oil onto the property of Steve and Patty Jensen of Tioga, North Dakota. Tesoro, along with federal regulators, later blamed a lightning strike for the rupture in the 6-inch-diameter steel pipeline, which ultimately covered 7.3 acres of land, or about seven football fields. Tesoro failed to recognize that its own pipeline had ruptured as the incident was unknown until the Jensens reported the spill several days after it began, underscoring long-standing concerns about pipeline companies’ ability to detect spills. Initial estimates downplayed the damage and estimated clean-up costs at $4 million. At the time, the company estimated that the clean-up of the site would take two years. How wrong they were. 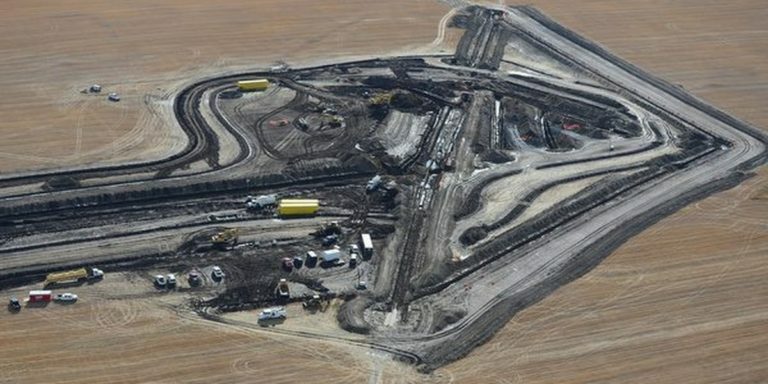 Three years after the spill, just one third of all the oil-soaked soil has been removed despite 24/7 clean up efforts. Initial estimates proved to be misguided as the oil had seeped much deeper than previously thought. Workers had to dig up to 50 feet below ground to remove hundreds of thousands of tons of contaminated soil. “It’s now just become part of our lives,” said Patty Jensen. “They are working 24 hours a day, seven days a week. But it’s so big and it’s not as easy to clean up as they thought it would be.” North Dakota Health Department environmental scientists Bill Suess told the Associated Press that he believes that much of the oil may not be recoverable, making the damage permanent. In May 2015, Tesoro stated that the spill should be cleaned up by mid-2017. However, the evidence suggests that they would be lucky to finish in 2020. Tesoro may be well aware of this as they have failed to set a new, more realistic date for when the clean-up will finish, an effort which may very well be indefinite. Now, clean-up efforts are expected to set the company back by $60 million, significantly more than initial estimates.